The resignation of an auditor can be a critical and highly exposed event with serious implications for the company and the auditors themselves. Resignation, particularly in debatable circumstances, can expose auditors to various risks, including the risk of litigation from creditors, investors and the company. Although auditors’ resignations have attracted substantial regulators attention in recent months, the specific obligations and risk factors associated with an auditor’s resignation have received little, if any, coverage. All such resignations are yet to get proper address mechanism as auditors must have fulfilled their obligation arises out of resignation of an auditor. There is a special legal compliance to be made by an auditor within 30 days of its resignations. There may be many more resignations because resignations at the mid-way are not a good idea with audit entities. Generally it happened with the signing of last year end reports to make a way to the new auditor in the coming AGM. Recently Indian Express carried a report about resignation of auditors of 204 listed companies. The number means that there was one resignation per day in the country. Mumbai was leading with 53 resignations from auditors of listed companies in the city. As per the Registrar of Companies (ROC) records, resignations were majorly from companies registered in Mumbai, Delhi, Kolkata, and Ahmedabad. In fact, three out of every four establishments in these cities saw their auditors quit. The number of resignations has raised eyebrows at various quarters. Almost all associated authorities has taken it as jolt to their established norms and established their own mechanism to deal such number of resignations. Though resignations are common every year but this year such resignations has certainly more to question. MCA, The regulator for the companies has already swung into action by started probing the resignation. MCA is taking it as unusual approach of auditor’s resignations in chain. The probe will focus on finding whether there were any financial irregularities at the firms along with ascertaining the real reason behind the auditors’ resignation. The Ministry of Corporate Affairs (MCA) has asked western regional directors of the Registrar of Companies (RoC) to investigate listed companies whose auditors resigned abruptly by May-end. MCA is not happy with the way auditors resigned from these companies. That’s why directed the regional director to provide a logical conclusion as to why these auditors quit suddenly. The auditor’s regulator, The Institute of Chartered Accountants has also observed it as extraordinary movement and decided to form a group to “examine the circumstances leading to the resignation of auditors. The President has conveyed the half line message in his latest monthly message at its journal about formation of such group under the convenor-ship of CA. Dhinal Shah a council member. He is a partner with a Big 4 firm. He and his team will examine the circumstances leading to the resignation of auditor and would also suggest a suitable mechanism to address the issues/ concerns for guidance of the members. The resignation process is set down by the Companies Act 2013. It is mandatory, and failure to comply with aspects of the process can constitute an offence under the legislation. The critical element is that the resigning auditor must provide the company with a specific statement. That statement must set out any circumstances connected with his resignation which the auditor considers should be brought to the attention of the company’s members or creditors. Alternatively, the resignation statement must confirm that there are no such circumstances. However, there is no bar on Auditors to resign or too continue with the companies. As an independent audit entity, they are having full liberty to choose the timing of resignations. Where does he resign in sensitive circumstances, an auditor can face two competing, and sometimes directly opposing, pressures when he considers any resignation statement. On one hand, it is his duty to tell the ‘interested parties’ anything about the circumstances of his resignation which he feels should be brought to their attention. This is a matter for the auditor’s judgment. If, for example, the auditor has resigned because he suspects fraud, malpractice or mismanagement which he has not been able to resolve with the company’s management, the ‘interested parties’ will feel that they need to know. Failure to comply with this obligation is an offense and could have far reaching consequences for the auditor. In contrast, the company’s management may be at pains to avoid any adverse publicity. They may wish to avoid publication of a resignation statement for entirely proper reasons (such as to protect the company’s reputation or its share price against what they may see as unjustified criticism) or for more partial reasons such as protecting their own position. In practical terms, management might seek to pressurize the auditor to water down or amend the resignation statement. Provided further that if the Tribunal is satisfied on an application either of the company or of any other aggrieved person that the rights conferred by this sub-section are being abused by the auditor, then, the copy of the representation may not be sent and the representation need not be read out at the meeting. Resignations by Auditors prior to the completion of their appointment period occur time to time. The reasons for resignations are many. Resignation may result from the discovery of illegal acts by clients or from the discovery of irregularities in financial reports which the client refuses to correct. The resignation may also be because of discovery of conflicts of interest or may be because of some ethical issues. Finally, an auditor may resign simply because of problems arising between the auditor and the client. There are many implied conditions attached to the auditor’s resignation for example there is an implied provision in every assignment that the client will cooperate with the auditor. If the client fails to do it, it’s simply a breach of implied provision of auditor’s appointment. Sometime continuance of office of the auditor becomes undesirable though not impossible or illegal. Personality conflicts and differences of opinion may also surface which makes resignation a desirable alternative. However, Auditors blamed they had taken this step as companies had failed to provide them with certain information. On their part, companies also did not mention why the auditors had quit in their filling and did not address the allegations made by the auditors that is unacceptable in the eye of law. The auditor should protect himself against any application which the company might make to prevent circulation of his resignation statement. The company has to show that the auditor is seeking to use the statement to obtain needless publicity for defamatory matter, which is a very high hurdle – it essentially requires the company to establish bad faith on the part of the auditor. The most obvious lines of attack would be for the company to allege that the resignation statement was recklessly inaccurate or misleading, or was being used by the auditor for a collateral purpose (such as self-promotion, or ‘revenge’ on the company following a disagreement). So long as the auditor takes care over the wording and factual accuracy of the resignation statement, and takes care to keep his own records of the objective reasons for his resignation, he should be able to defend his conduct against any subsequent attack. However, the more latent and potentially far more serious exposure for the auditor arises in relation to the ‘interested parties’. If he resigns because of knowledge or suspicion of fraud or mismanagement in the company but then fails or fails adequately to disclose this in a resignation statement, subsequent claims against the auditor could well follow. If the fraud or mismanagement which prompted the resignation continued undetected thereafter, the accumulated losses which the company or the interested parties might later seek to recover from the auditor could be substantial. Given the specific statutory duty to prepare a resignation statement for the benefit of an identified class of people (the interested parties), there are clearly arguments that the obligations on resignation are materially different from the usual obligations to report on a company’s accounts, and that a wider duty of care should exist when resigning. STATUTORY PROVISIONS RELATED TO AUDITORS RESIGNATION. Section 140 (2) The auditor who has resigned from the company shall file within a period of thirty days from the date of resignation, a statement in the prescribed form with the company and the Registrar, and in case of companies referred to in sub-section (5) of section 139,the auditor shall also file such statement with the Comptroller and Auditor-General of India, indicating the reasons and other facts as may be relevant with regard to his resignation. Deloitte Haskin and Sells stepped down Manpasand due to lack of documents to support costs, revenues and capital expenditure at the company.Sai Kanwar and Associates resigned from Fourth Dimension Solutions because of some health reasons; Sansand and Associates was dissolved so resultantly Touchwood Entertainment audit ceased; V Shivkunar and Associates was disqualified by ICAI; and MR Ravindra Sharma & Associates quit Hanung Toys audit due to “pre occupation in other assignments”. Price Waterhouse Chartered Accountants stepped down as auditor of Atlanta saying the infrastructure engineering firm did not share “significant information” and “significant observations by tax authorities” as requested. Where documents were shared, PW said, they were not provided in a timely manner and therefore evaluation of the financial statements of Atlanta suffered, according to the resignation letter. “Under the circumstances, we are constrained to withdraw from the audit engagement in compliance with the Standards on Auditing issued by the Institute of Chartered Accountants of India and this communication should be considered as our letter of resignation under the Companies Act, 2013”. The reasons behind the auditor exits have ranged from lack of adequate information on the company’s businesses, revenues, tax observations to ‘mutual exits’. Some exists were also because of “health concerns” and “pre-occupation”. In some other cases, the firm simply ceased to exist. In cases where the auditors have exited due to lack of adequate information, or for not getting ‘reasonable assurance about the financial statements being free from mis-statement’, the concerns have been conveyed to the MCA by the Auditors. 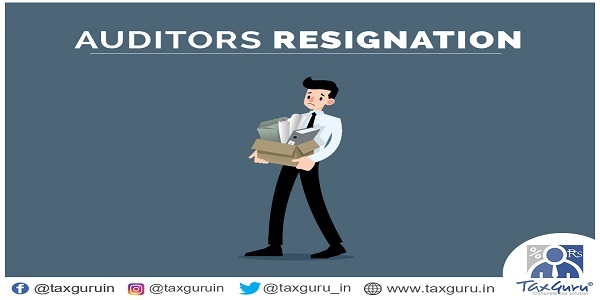 If auditors use resignation more regularly in a bid to extricate themselves from high-risk audits, it is inevitable that attention will focus on the resignations if subsequent problems at the company are uncovered. In most cases, auditors are resigning invariably due to concerns over the integrity of the management. While it may absolve them of responsibility, this weapon of resignation is like capital punishment. It should be applied only in the rarest of rare cases. It leaves the entire shareholding community guessing and leads to considerable uncertainty among the investors. It also leaves the future of the company unclear. Therefore, there is high grade adversely chances of affected interests of employees and other stakeholders. The responsibility of company management and the audit committee is absolute, and they should ensure that all information sought is provided to the auditors. The board of directors of the company should be extremely worried about this. There cannot be a situation where the board is right, and the auditor is wrong or vice versa. With reference to the investors, the board should clearly take a stand and explain the circumstances with full facts and figures. Very well drafted article on resignation of auditors setting the future implications on the career of the auditor.